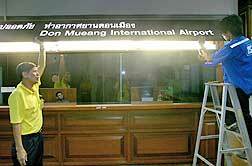 Bangkok International Airport has been officially renamed Don Meuang Airport in light of its reopening. The airport will offer services for all domestic flights by One-Two-Go and Nok Air beginning on Sunday. Kalaya Phakakrong, acting president of Airports of Thailand, said that from March 25, Don Mueang would handle 140 flights and accommodate 18,000 passengers a day.